La Buena Onda provides all of the amenities that you are looking for (Free morning coffee, free wireless internet, outdoor patio with hammocks, cable tv, balcony, laundry service, great book exchange, movies, and more!) and also serves as a great base to explore the surrounding mountains, waterfalls, and coffee farms. We promote the plethora of eco-tourism destinations in the area and support local artisans, producers of fair-trade products, and especially local farms. So grab a coffee and relax with us and experience real Nica life! Staff was friendly and helpful. Wifi was good. Nice atmosphere. Will definitely use again when back in Matagalpa. Lovely hostel, staff are all really helpful and friendly, the place is clean and spacious with nice bathrooms and comfy beds and of course it was great to hang out with Carlos the rabbit! Great spot! Super hot electric showers in the huge, spacious 8-bed dorm. Comfy beds. In addition to this, they have the largest locking closets I have ever seen! The staff and owners were always happy to answer all my questions. This was a great place to base myself as I explored the surrounding area. A nice spot to meet other travelers of all ages. I originally booked for 3 nights but stayed for 7. Good hostel. Not very quite because all the traffic outside and no thick walls/windows. If you are not good sleeper you might have challenges.. Good location near to the central park. This hostel is nice and clean but don't have much atmosphere, I felt like staying at a hotel. Matagalpa is small so almost everything is in walking distance from the hostel so the location is good. The shower was ice cold! But the bed was good, it was very quiert and I looovved the big lockers in a separate room. 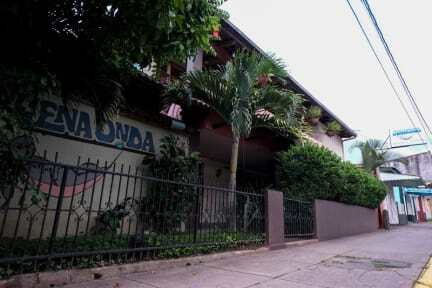 Buena Onda was a decent hostel in Matagalpa with a pretty central location and no real complaints about the facilities. Staff need to be more clear on recommended activities though... I nearly set off on a hike based on one recommendation that a different staff member told me was not safe due to multiple assaults on tourists per week. Luckily I checked some details at reception before setting off! Suitable for the suitcase folk,looking fo cheap accommodation. Not a Backpackers’s hostel. The staff where very helpful. The dorms clean,spacey and comfortable. Tourism in Matagalpa is dreadful.